Okay, so I had someone ask me how to make a freeze frame effect on Vegas, and I thought I should just make a tutorial about it incase anyone else was wondering or wonders how to do this. The effect looks like pictures but they are clips. If you notice, they look like pictures because I froze all of the clips. -To freeze clips you must follow these steps in order to make it look completely frozen or else it will be shaky or it will move a bit and it won't have that "picture/freeze" look. I'm using a clip of Sun and Jin as my model. *Keep in mind, I use Sony Vegas 7 as my vidding program. 1. First, I split my clip into pieces and freeze all of the pieces individually. This is very tedious, time consuming and it's not an easy task, but in the end it looks great! But first, you'll need to know how to freeze a clip. Add/insert velocity to the clip. To do that you have to right click on the clip and a menu will pop up, click on "Insert/Remove Envelope" and click on velocity. 3. Once you have added the velocity a light green band/line will show across the clip and there will be a tiny green half square on the far left side of the line. Go to the beginning of the line, on the very edge and double click right next to the little green square and it must be next to it. Make sure a whole, tiny, light green square appears. Then repeat the same thing, except on the very end of the clip. 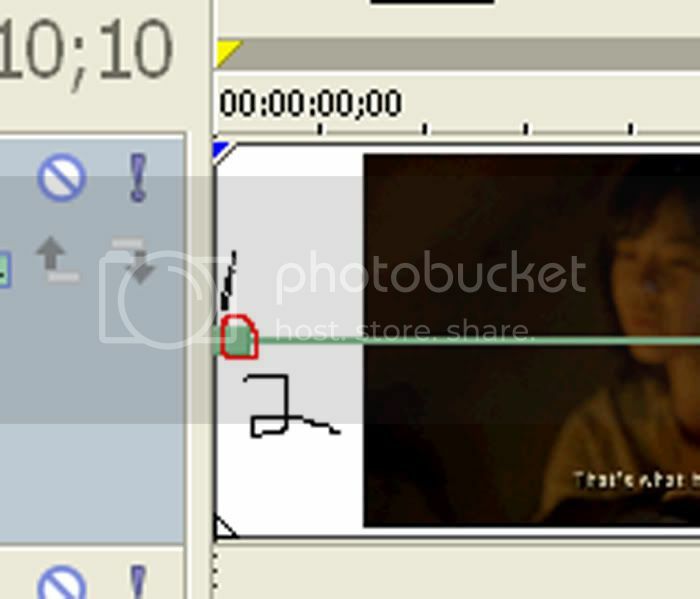 At the very end of the clip, you'll need to make two squares and to double click. 2.One next to the square on the far left edge of the clip and it should look they are touching. 3.One next to the square on the far right edge of the clip and it should look they are touching. *It's okay if you stretch the clip on your timeline, the square looks further away from the square and it isn't next to it. It still will look frozen once we do the next steps. 4. Next, you have to right click square #2. I numbered the squares, the one on the left edge is #1 and the one next to it is #2. I circled it in red. When you right click on it, the menu will pop up. Click on "Set to"
It will say "100%" change that to "0%"
Do the same thing for square #3 next to square #4. Set square #4 to "0%"
I circled square #2 and #4 because those are the ones that have now lowered themselves on the clip. You should have set square 2 and square 4 to 0%. 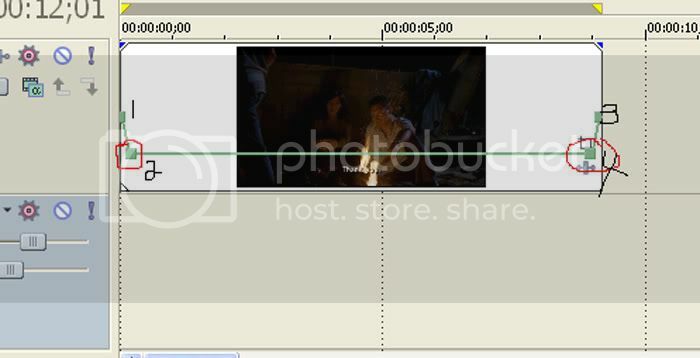 You may have also noticed that the clip is now frozen and only shows what the very first moment of the clip was. Now this was the entire clip I froze. This is three pieces of the clip that I split and I just perform those four previous steps to all of these pieces. 5. Then, finally, mesh them or blend them together with a beautiful "Dissolve" or "Flash" transition. I usually prefer the "Dissolve" transition. You may have to split the clips into really tiny pieces because you don't want to watch a frozen clip for too long, you want it to go fast. Phew! Yay! That's the end! If anyone has any questions, let me know, I hope this tutorial helped anyone who would like to know how or was wondering how to do this! Thanks Kate! This is great; just what I needed. It's really not as complicated as I thought. I just have to do the tedious job of freezing all those frames. Wow! I always thought it was just pictures! That looks complicated to me It's amazing how you use that in your vids. I may try it some time, thanks for telling me how! Yael, Argh I know. Those tedious freeze frames can be pretty time consuming. I'm soo glad I've helped you though! Jemmz, really? Nah, they're clips, if I used pictures, the quality wouldn't be as good, but it is still possible to use them. It can be a little complicated at first but once you get the hang of it, you do soo fast and it looks so amazing. You should probably try it when you know you've got a lot of time on your hands and when you've got some good beats to use it for. I've always wanted to learn how to do velocity envelopes! That's so cool! Thanks so much for this! Be sure to link this in to the Technical Guides thread so it won't ever get lost in the shuffle! Thanks again for this! I'll have to try that some time (I'm one of the ones who just uses screencaps to get that effect but it can be hit or miss sometimes with that ). No problem Ais! I think your little effects are always awesome, especially in your DW vid "Almost Lover" with Nine/Rose disapearing! I'm glad I could help you. I added it in as well. Awww, that's so sweet of you to say! *squishes you* Thanks so much! ♥♥♥!!! 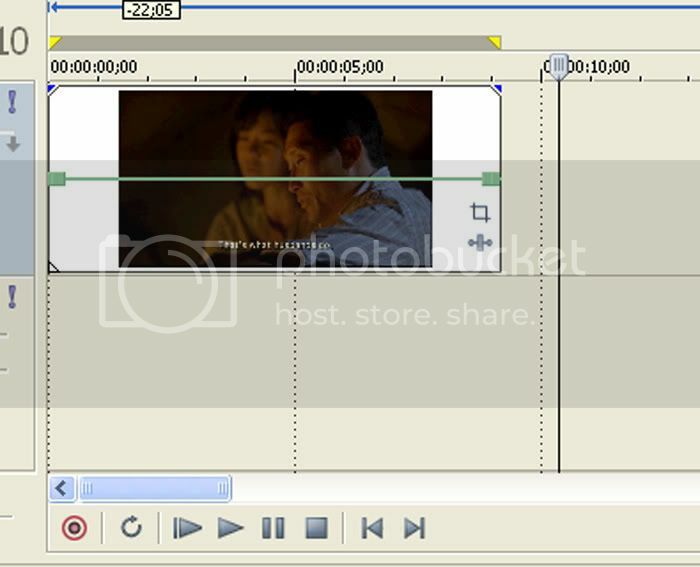 You have no idea how long i was killing my self to find how to freeze a frame without take snapshot!! I love you!! Works perfect for me!! You didn't know how to freeze a frame? Really? Aww! I'm soo happy I've helped! Yay, I got this to work! It is actually easier then it looks lol Thanks again for the tutorial, Kate! Oh, that's cool Jemma! Sorry I didn't see your reply sooner, which vid did you use it in?